Indiana State University senior Lindsey Butorac enjoyed flying in airplanes with her friends who are pilots, and even mulled changing her major to aviation. Though she didn't make the switch, an activity in a new honors course this fall led to her soaring over the Wabash Valley - at least for a little while. Butorac was among a group of nine ISU students who spent a late October Saturday practicing their hand at piloting an aircraft. 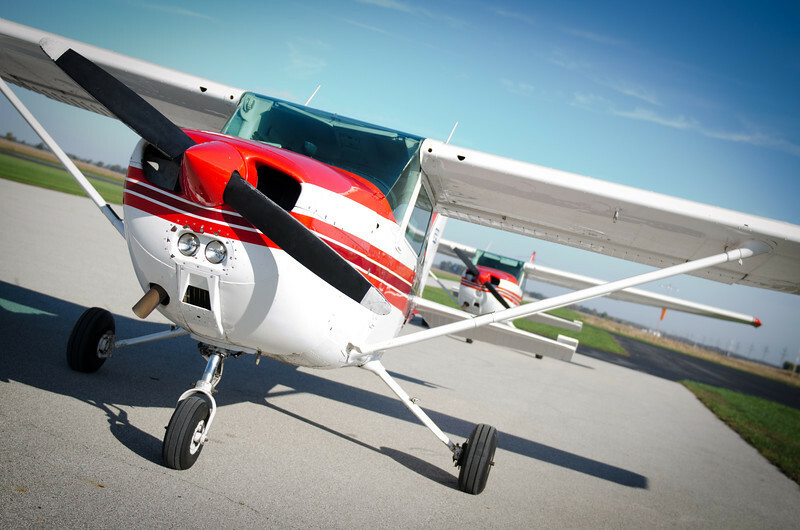 For several of them, the first time piloting a plane came as part of a new honors course taught by Troy Allen, an associate professor of aviation and assistant dean of the College of Graduate and Professional Studies at ISU. The class introduced students to different aspects of aviation technology, and even included the event that took the interested students out for a day of flying to three airports in west-central Indiana. "This is the first time this class has been offered," Butorac said, "and so as soon as I saw it, I knew that I wanted to be in this class." The students divided into groups of three and each joined a certified flight instructor in three four-seat airplanes. The group left from Sky King Airport near Terre Haute and flew to Sullivan County Airport, where students then changed pilots before heading to Putnam County Airport in Greencastle. They ate lunch before switching pilots a final time and heading back to Sky King. Though the students controlled the airplane for most of the flight, the flight instructors sat next to them in another piloting seat with controls to help steer the plane back on course as needed. "It's a great experience to actually feel like you're in control of the aircraft, because you're not just flying in an airliner or something like that," said sophomore John Davis, criminology major from Terre Haute who participated in the event. "It's 100 percent different." A similar exercise is offered with high school students in a summer honors course Allen teaches. Yet that class is much shorter than the semester-long course taken by the ISU students, which allowed for more preparation time. Still, they didn't exactly know what to expect, Allen said. "They thought it'd be like a roller coaster ride," he added, "but once they got up there and saw how structured it was, they were very comfortable with it." ISU student Allison Gary was a bit apprehensive as the flight approached. But the students practiced for several hours on a flight simulator to prepare. Once the day arrived, she flew in a plane with Butorac, who like Gary, a sophomore psychology and criminology double major from Indianapolis, had never flown a plane before. Flying with other students in a similar situation coupled with all the preparation the students received helped make her "less jittery." "This isn't like other classes, where you just learn it to learn it," Gary said of the flight lessons. "This is a real-life situation." Allen hoped that the project, and the class, would spark enthusiasm for aviation among the participants. They spent several weeks learning about flight instruments and how they worked, before students then learned more in the simulators and taking to the air. One student has since suggested that he might minor in aviation. "You just can't supplant the excitement of getting out there in the aircraft and flying it around," Allen said, "the feeling of getting away from the earth and just seeing it from a completely different perspective. Each of the students had about a half an hour of flying time, Allen said. They flew the plane for most of the flight, which included the descent, as the plane was preparing to land. Depending on the instructor's comfort level and how the students performed, they also did more prior to takeoff and landing, Allen said. Yet the instructors were always at the second set of controls in the planes and ready to help the students if slight corrections needed to be made, as well as when they needed to fly the plane. Though this was the first time the event was run, several students agreed that they would recommend it to others. "This is kind of a trial run," Butorac, a business management major from Bloomington, Ill., said of the course. "We're like little test dummies, but we're doing really good so far." 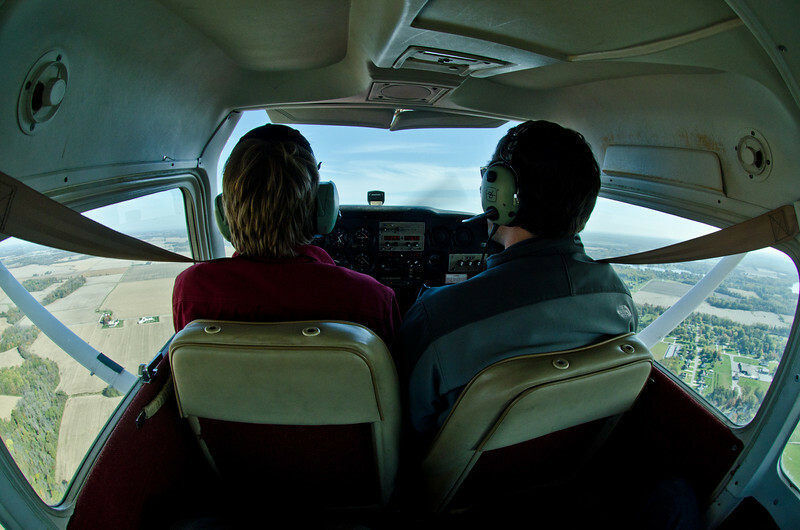 Indiana State University student John Davis flies the plane as he next to a certified flight instructor. Davis was part of a group of students from a new course this fall that went flying from Sky King Airport in Terre Haute to airports in Sullivan and Greencastle before heading back to Terre Haute. For several students, it was the first time they ever had an opportunity to pilot an airplane. The planes used by the Indiana State University students line up on the runway. The planes departed about five minutes after each other. The Indiana State University group participating in the flying activities. 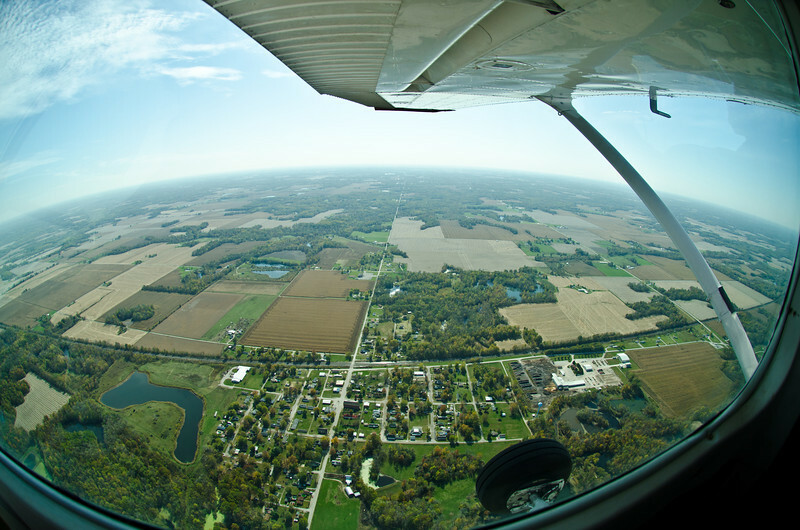 An aerial view of the Wabash Valley. Contact: Troy Allen, associate professor of aviation and assistant dean of the College of Graduate and Professional Studies, Indiana State University, 812-237-2660 or troy.allen@indstate.edu. Nine students spent a late October Saturday practiced piloting an airplane. For several of them, the first time piloting a plane came as part of a new honors course taught by Troy Allen, an associate professor of aviation.